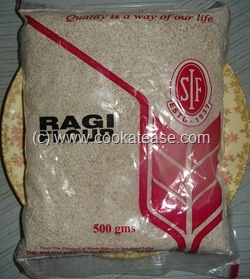 Ragi is a tiny brown or red cereal. It has many beneficial properties. In southern India it is recommended as food for infants of age 6 months and above. 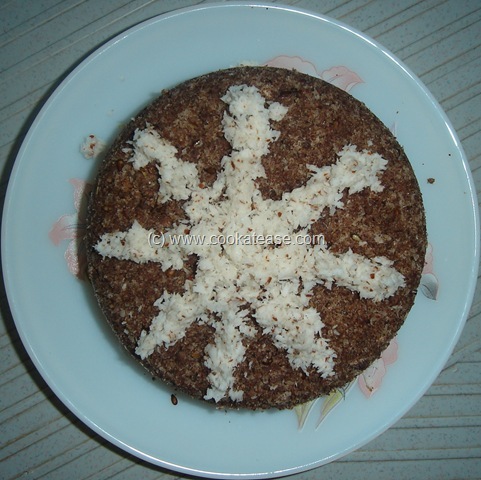 Ragi is a staple food. It was mainly consumed in villages previously. But nowadays due to growing health awareness, people in cities have also started using it in their diet. 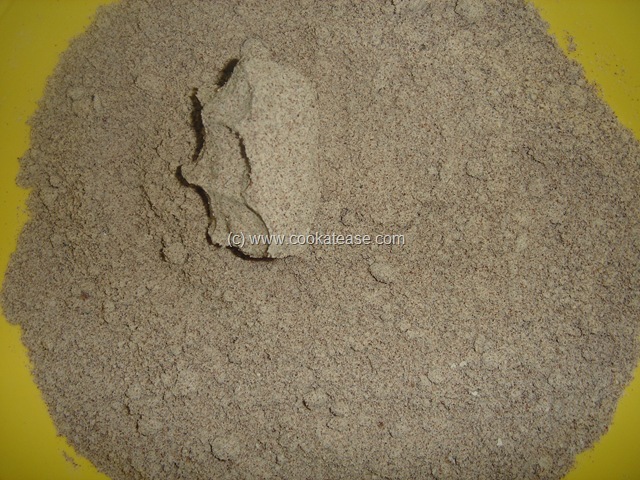 Ragi contains amionoacid methionine which is lacking in polished rice. It is highly nutritive. 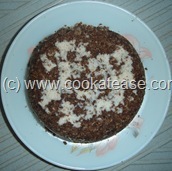 Ragi is rich in calcium, iron, fiber and is of low calorie. 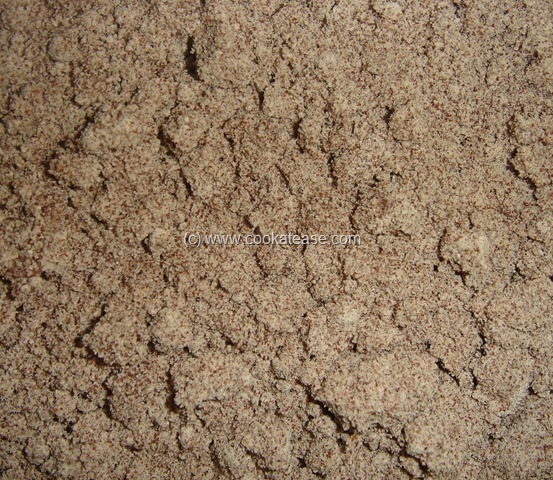 Ragi can be used to prepare variety of dishes like Puttu, Bread, Dosa, Mudde, and Porridge. Here I have prepared Puttu using a pressure cooker. 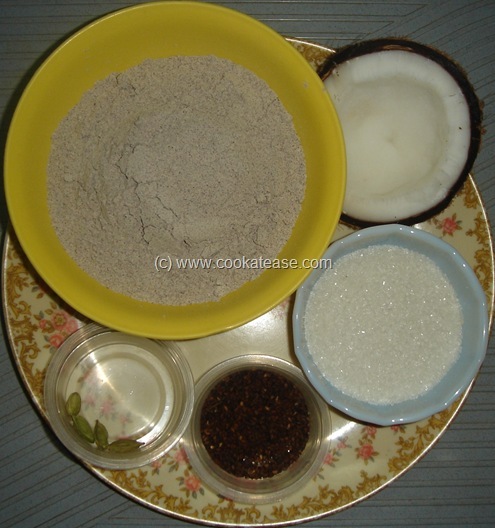 It can also be prepared using puttu vessel. Cooking time: 15 to 20 minutes. 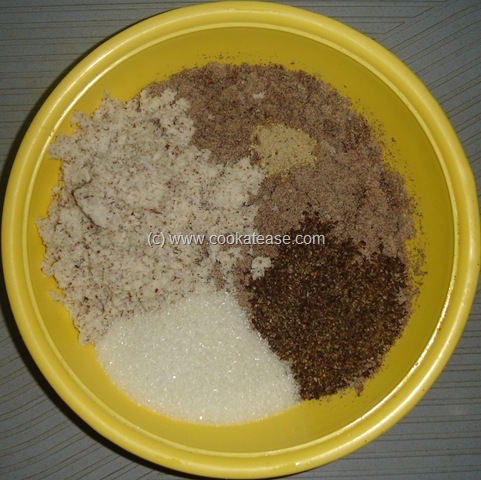 Mix salt and Ragi flour, sprinkle handful of water; mix well and hold the flour in your fist tight; the flour should bind slightly; if the flour is not binding, sprinkle one or two more handful of water and continue till the above explained consistency is reached (as shown in photograph). Take a cotton cloth, put flour in this, tie loosely; steam it in a cooker (without weight) for 10 minutes. Clean and roast black sesame in a dry pan, till it pops; cool it and powder it coarsely; powder cardamom also; grate coconut. 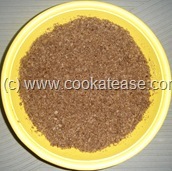 Take out Ragi flour, (view photograph to observe colour change after steaming) mix it gently to remove lumps if any. Add sugar, cardamom powder, grated coconut, sesame powder and oil /ghee; mix well. This post is part of WYF:Breakfast Event organized by Simple Indian Food Blog. Kamala you can send this too for the event. I’m from Malaysia. I would like to have you tube video how to do ragi flour puthu. I need the recepe as I need go on diet. 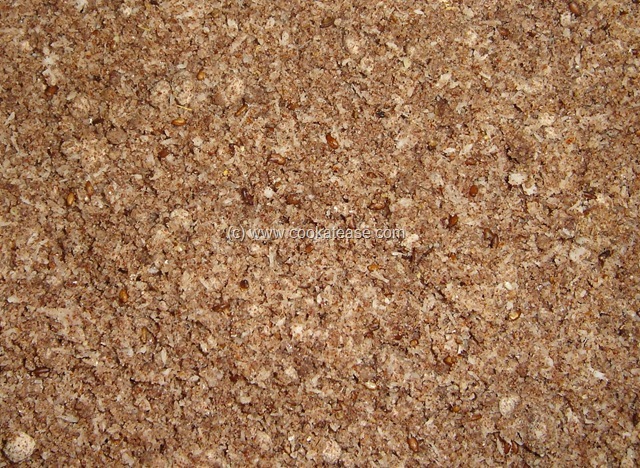 Can I use the fine grinded Ragi flour from the machine or need? or the flour must be follow like the texture of rice flour puthu. I need to know the texture of the flour first. Second I need to know the method of making these ragi puthu. Plse give me the website that I can follow up. Many thanks.